Back in 1901, a New Yorker with the name Edgar Reuben Preyer wrote a fine book on the distilled spirits business. 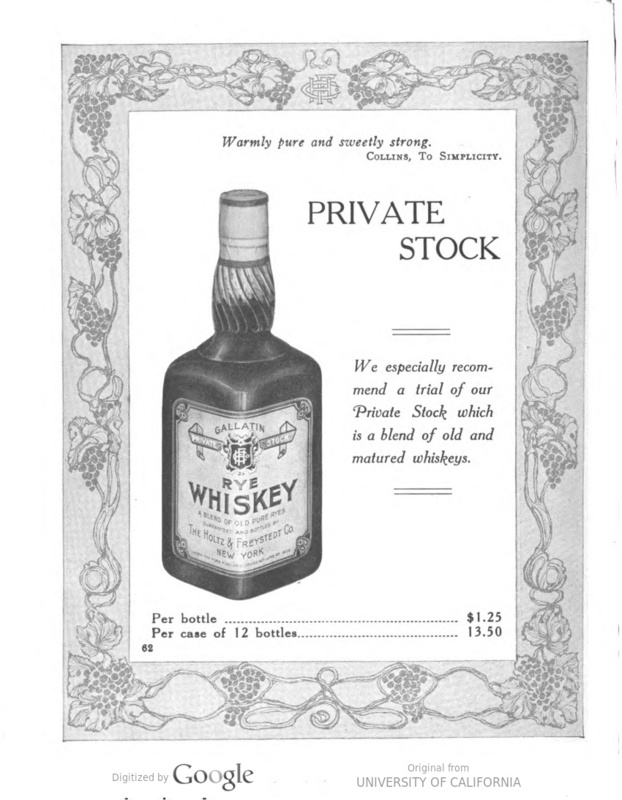 It covers “everything”, as its careful and intelligent author claimed in the introduction: the basic science behind distillation; mashing and grains; the different types of spirits; holding whiskeys in bond; taxes; rye whiskeys; prices and costs; the distribution side of the business; rectification and blending; and more. Here is a link to the book, from Hathitrust digitized library as are most of the books I’ve linked recently (and like them indicated as in the public domain, whence my quotes or reproductions, with all feedback welcome). Many impressions are left by this book. I’ll detail a few but encourage fans of whiskey history to read the full book. Preyer’s explanation of sweet and sour mashing is broadly similar to the others I’ve discussed, but with a gloss on back-yeasting. He states that at the beginning of a distilling season a mash is left to ferment naturally in small tubs which he says (correctly) is sour mash. Once a fermentation is secured, the yeast, or barm, is used to seed the next one and so on. He calls that a sweet mash, which is correct too because yeast is being added by the distiller. Clearly some distillers operated in this way but there can be no doubt that some never yeasted back and relied for all their fermentations on natural fermentation as I have documented now from numerous sources. Then too, sometimes you would start with a sweet mash and move to sour, in that once enough backset was produced, you would mash with that and add no further yeast. This was the system C.K. Gallagher laid down as I’ve also explained recently. There are only three basic ways to yeast: naturally, back-yeasting, and with a yeast mash (“from jug to dona to vat”). But there can be variations in each method and differences in their order. Preyer, relying on the memories of aged distillers who recalled farm-distilling days, states (see pg. 44) that the distilling seasons of spring and fall emerged in the days when distillers relied on natural organisms to ferment. This was because the natural yeasts were most propitious then to a good result. In the winter, the whiskeys were too light and “deficient in flavor”. In the summer, the wild yeasts produced too many fusel oils. There is an analogy here to lambic production in Belgium, which remains seasonal to this day. Preyer doesn’t claim that ferments would sour in the summer, which seems to me a beer-brewing concept applied by some wrongfully in the whiskey context: he says the whiskeys were too oily from secondary constituents. He indicates with his typical thoroughness that as distilling became more sophisticted, it could take place year-round. The point being, the famous Kentucky distilling seasons have their origin in small tub natural (spontaneous) yeasting. Preyer notes that Kentucky’s fame as a whiskey-centre was due in no small part to whiskey distribution becoming a sophisticated business and located mainly in Louisville. It is today too easy to forget that distilling was just part of the story. Getting the product to what became a national market was a separate endeavour in which Louisville commerce specialized. So was the practice of selling whiskey in bond to holders of warehouse receipts and the trading in these, which Preyer explains very clearly. He makes some very interesting comments on rye whiskey. Contrary to some who say that Kentucky always made rye whiskey, he states that its whiskey was based on corn – bourbon. To compete with “Eastern” rye producers, i.e., in Maryland and Pennsylvania, Kentucky started to make rye later in the 1800s. In most sources of this type, you rarely read any criticism. Industry members often advertised in the books to recompense the author and anyway people in business are not usually inclined to say bad things about others in a similar line. But Preyer states flat-out that the quality of Kentucky rye wasn’t very good for quite a while. He says Bluegrass distillers had little experience making rye and made mistakes, such as not choosing the grain carefully enough and aging the whiskey three years in “cold” (unheated) warehouses. Eastern ryes were emerging after three years with fine colour and maturity due to their sojourn in heated warehouses. The heating encourages more “cycles” for the whiskey in the barrel – expanding from and receding into the frame of the barrel as the temperature rises and cools – which accelerates maturation. Preyer states though that Kentucky got better at making rye as time went on. Perhaps he didn’t really knock the industry as Kentucky’s fame then and now was based on straight bourbon, not rye. But it ties in to something I recall from early trips to Kentucky when some distillers would say, “we don’t know rye well or didn’t until we decided to make it”. Straight rye was the great drink of Pennsylvania and Maryland, now lost although craft distilling has started to bring it back, e.g., Dad’s Hat in PA. Regarding blending, a topic not unfamiliar to those who plumb whiskey history, Preyer has little time for blends which include neutral alcohol. He talks solely about combining straight whiskeys including rye and bourbon together, and was a great proponent of blending in this sense. We call it today vatting, a practice I advocated for years on straightbourbon.com, encountering not a little resistance at the beginning. I was using Scots practice as a template but had also read predecessors of Preyer such as his fellow New Yorker Joseph Fleischmann who wrote a similar book, but not as well, in 1885. In our vernacular, Edgar Preyer would be thrilled to see the skill with which modern acolytes of vatting practice their art especially on straightbourbon.com. He probably never dreamed consumers would do it on their own, but then lots has changed since his time in the business. (And lot’s hasn’t). He’d get it totally though, I don’t doubt it. See below a page reproduced from the book on the topic. A rough count of the distilleries listed in Preyer’s book for Kentucky is 400 – 400 distilleries! Today you can count them on two hands. And 400 was nothing really because since 1860 as Preyer explains so well again, the industry began to concentrate under the pressure of tight federal regulation. That era was introduced with the first tax on whiskey, levied by the Union to help win the Civil War. There were probably a thousand or more distilleries in the first half of the 1800s. The proliferation of distilling and yeasting methods is no surprise given how many producers there once were. One wonders what happened to Mr. Preyer, an exemplar of his trade and no doubt very successful at it. I mean, what happened when the Volstead Act in 1919 put an end to beverage alcohol in America. He would have been nearing 60 and perhaps retired, or went into another business. 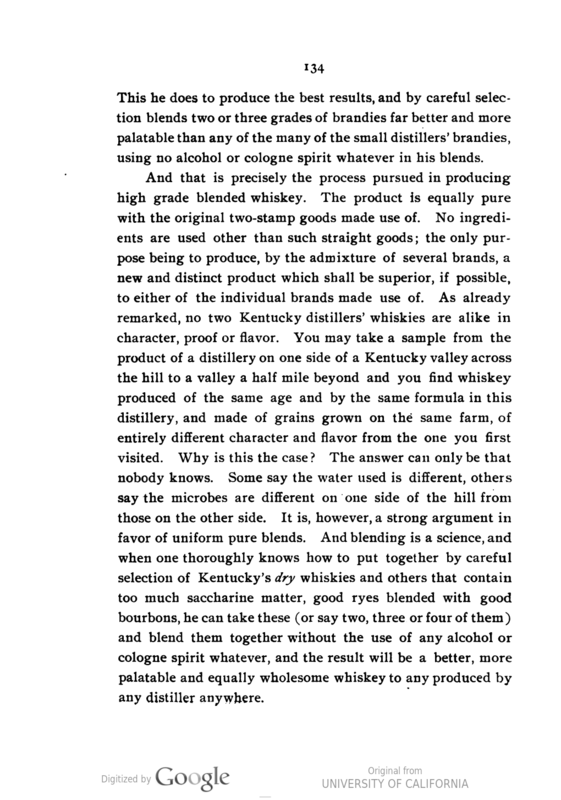 Tom M. Gilmore, who wrote the whiskey chapter in E. Stoddard Johnston’s 1896 history of Louisville and published Bonfort’s Wine and Spirits Circular, is cited, among numerous others, as a source in Preyer’s book. Whiskey was a small world then; in some ways it still is. According to a brief New York Times obituary, Tom Gilmore died in 1921, of Bright’s disease, hastened it suggested by the ruinations to his business of National Prohibition. Alcohol hurt a lot of people on its way up in commercial America (North America) in the 1800s. Prohibition hurt a lot of people, too.